You reuse your stock shroud and wiring. All you need to do is cut and solder the blue and black wires, and finish with some heat shrink tubing. No pics needed, its a 1-2-3 deal. Make sure you loctite the screws when you put it all together. I dont know why people say the first generation eclipse is a replacement. The whole thing with the shroud is not a drop in, nor is the motor. I ordered both from rock auto,2 different brands, and they dont fit- if they do post pics and show us. In any case if you are getting them from the aftermarket, they are typically repro junk, and are $115-150. The Subaru ones are oem and made to last a lifetime. MY 1999 Impreza has 189,000 miles and they are the original fans! 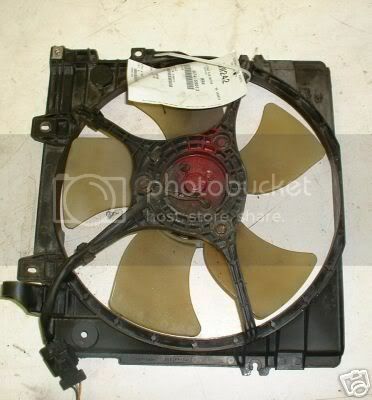 The Subaru Part number for the primary cooling fan is 45121FC050 . This fits most 1993-2001 Imprezas. Maybe higher years as well in case you are hitting the junk yard. The secondary or A/C cooling will probably work also but I didnt try it. Its part number is 73310FC050 . The primary has less blades the a/c more blades, same as our cars. I got mine from Subaruonlineparts.com They will give special pricing for Starquesters of $140 plus shipping for the primary cooling motor/blade assembly, and $160 plus shipping for the A/c motor assembly, just mention it in the order notes. Go here and paste the part numbers in the part number search box,add to cart and check out. Finally running cool, and I didnt have to go after market, spend a lot of money or hack up my wiring. Edited by conquest396, 04 April 2012 - 07:59 PM. Good find, thanks for posting that!!!!!!!!!! awesome find, will get a set soon enough. Edited by The Rabbit1, 02 April 2012 - 11:14 PM. so you didn't use the green wire? We needed some elect. fan options. guess I got the wrong ones, mine have a blue and green wire and they do not just fall in to our stock shroud. but with these two wires I do have a low, med, high speed, maybe I will run it in high and make them work for now..
are not drop in compatible. yse, but the motor in the pic has three wires, and nether the mounting screw holes line up, nor does the motor fit perfect in our shroud. Maybe you got the wrong part then . This is a Direct bolt in with the part numbers I posted. That might be from a Forester or Legacy or different year.45121FC050 = primary cooling fan motor and fan blade. Drop in. Solder Two wires. Done. Edited by conquest396, 24 May 2012 - 09:25 PM. well just ordered some fans we will see what happens. just a link to some info i found. Edited by importwarrior, 05 March 2013 - 09:11 AM.